TLDR UpFront: A jailbreak in Marawi is jut one in a long history for ISIS. Salafi-takfiri groups have used jail breaks and prison attacks to bolster their numbers for well over a decade. Indeed ISIS owes its genesis to a 2012-2013 Al-Queda/ISIS operation named “Destroying the Walls” which freed an estimated 4500 skilled salafi-takfiri worldwide. Of these an estimated 1800 may have ended up in ISIS by the time it was cutting ties with Al-Queda and seizing Ar-Raqqah in Syria in early 2013. FullContext in the Back: Jail breaks and mass prison escapes were a primary recruiting tactic of the Islamic State to obtain experienced militants prior to becoming an emerging-state actor. 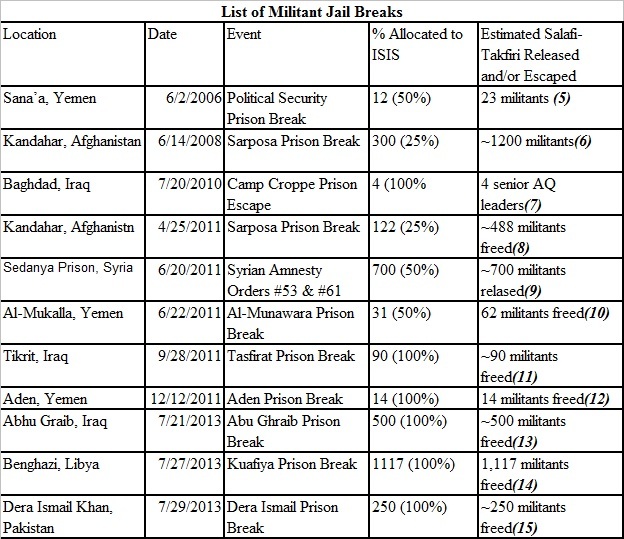 (1) The following table lists specific jail breaks that have may have provided recruits to the so-called Islamic State. The percentage allocation is an estimate at best. Open-source details of where militants went after being freed is difficult to obtain. Guidelines used are prison escapes directly attributed to the Islamic State, or its previous incarnations, or within their sphere of influence (Syria or Iraq) are allocated at 100%. Likewise operations conducted during the (then ISIS) campaign of “Destroying the Walls” which ran from July 2012 through the end of 2013 excepting those obviously conducted by a separate group with no operational linkage to the Islamic State (e.g. Boko Haram) which are not listed. In August of 2013 INTERPOL issued an alert regarding this effort after “a series of prison escapes across nine INTERPOL member countries in the past month alone, including Iraq, Libya and Pakistan.”(2) The close clustering of a number of major prison breaks during the 2012-2013, and especially Jun-August of 2013, indicate a potential operational tie with the Islamic State’s campaign. The assumption that these militants eventually in part came to ISIS is in part based both on the stated aims of “Destroying the Walls”, personnel accounts of escapees joining ISIS(3) and that ISIS specifically tracks “Prison Escapes” as a strategic metric in it’s 2013 Annual Report. (4) Operations conducted in Yemen are allocated 50% to the Islamic State and assumed that 50% of the militants returned to Al-Quead in the Arabian Pennisula (AQAP) or other factions. This is based off the strong ties between the two groups prior to the Islamic State’s breakoff from Al-Queda. Operations conducted in Afghanistan by the Taliban, are allocated at 25% of the Islamic State – these operations occurred while the Islamic State, primarily known then as Al-Queda in Iraq, was strongly connected to the Al-Queda global network and leading the insurgency in Iraq. Elvis Al-Presley has left the building. (1) Evidence suggests Boko Haram has also adopted this tactic of recruitment through jail breaks. Over several incidents 2012-2013 Boko Haram militants freed several hundred of their fellow militants from Nigerian prisons. However these are not included because there is no strong evidence that Nigerian militants have joined ISIS. (3) Tim Arango and Eric Schmitt, “Escaped Inmates from Iraq fuel Syrian Insurgency,” New York Times, http://mobile.nytimes.com/2014/02/13/world/middleeast/escaped-inmates-from-iraq-fuel-syria-insurgency.html?referrer=&_r=0, accessed September 29th, 2014. (4) ISIS Annual Report TBD. (5) Adel Al-Haddad, “23 Al-Queda suspects escape from Political Security Prison,” Yemen Times, http://www.webcitation.org/query?url=http%3A%2F%2Fwww.yementimes.com%2Farticle.shtml%3Fi%3D918%26p%3Dfront%26a%3D1&date=2009-09-07, accessed September 23rd, 2014. (6) Carlotta Gall, “Taliban free 1,200 inmates in attack on Afghan Prison,” nytimes.com, http://www.nytimes.com/2008/06/14/world/asia/14kandahar.html, accessed September 23rd, 2014. (7) Martin Chulov, “Iraqi officials investigate warden’s involvement in al-Qaidia jailbreak,” theguardian.com, http://www.theguardian.com/world/2010/jul/25/iraq-al-qaida-prison-warden, accessed September 23rd, 2014. (8) Taimoor Shah & Alissa J. Rubin, “Taliban breach Afghan Prison: Hundreds Free,” nytimes.com, http://www.nytimes.com/2011/04/26/world/asia/26afghanistan.html?hp&_r=0 accessed September 23rd, 2014. (9) In 2011 Syrian President Assad issued Amnesty Orders #53 & #61 which emptied Sedanya prison of all Islamic Militants. Although this was presented as a ‘reform’ it was considered at the time an intentional act by Assad to radicalize the opposition. Although not a prison ‘break’, the influx of hardened militants into ISIS ranks is included in the Prison Break/Amnesty flow. (10) Rania Abouzeid, “The Jihad Next Door: The Syrian roots of Iraq’s newest civil war,” Politico.com, http://www.politico.com/magazine/story/2014/06/al-qaeda-iraq-syria-108214.html#.VByn7xafgzd accessed September 19th, 2014. (11) Reuters News, “Dozens of Al Queda militans escape from Yemen Jail” reuters.com, http://www.reuters.com/article/2011/06/22/oukwd-uk-yemen-qaeda-idAFTRE75L1KG20110622, accessed September 23rd, 2014. (13) ABC News, “Al Queda Militants tunnel out of Yemen Jail,” abc.net.au, http://www.abc.net.au/news/2011-12-12/al-qaeda-militants-tunnel-out-of-yemen-jail/3727376, accessed September 23rd, 2014. (14) Bill Roggio, “Al Queda Assaults Iraqi jails, free hundreds of prisoners,” longwarjournal.com, http://www.longwarjournal.org/archives/2013/07/al_qaeda_assaults_ir.php, accessed September 19th, 2014. (15) Al Jazeera News, “Explosions Target Benghazi judicial buildings,” Aljazeera.com, http://www.aljazeera.com/news/africa/2013/07/2013728185027351689.html, accessed September 23rd, 2014.